It's not easy to find budget friendly accommodation in Edinburgh, especially during the busy Festival period, but at Euro Hostel Edinburgh Halls we can offer you just that. Located just a 5 minute walk from the Royal Mile (High Street) in the centre of the world-famous Edinburgh's Old Town, our self-catering apartments allow you to book accommodation for parties of all sizes whether you're travelling alone or with a small or large group. At Euro Hostel Edinburgh Halls we offer the best budget accommodation in Edinburgh's city centre. We have apartments accommodating from 3 to 12 guests all starting from as little as £20 per person, per night. Euro Hostel Edinburgh Halls is an ideal choice for backpackers, workers, Festival performers or 'city breakers' as we offer accommodation to suit any budget. There's nowhere else you can get such great value in such a fantastic location. We offer a comfortable stay in a convenient location all at budget friendly prices! Here at Euro Hostel Edinburgh Halls we're located right in the Heart of Edinburgh's Old Town just minutes from the Royal Mile. This makes us ideal for backpackers, shoppers, groups and concert/festival goers. All of our bedrooms are private, lockable singles or twins which are all located within shared self-catering apartments for up to 12 guests. All of our apartments have shared bathrooms, kitchen and lounge/dining room. Our kitchens are fully equipped with everything you might need during your stay. For 2018 we are open from June 4th until August 31st. If you’re bringing a car with you on your trip to Edinburgh we have limited spaces onsite priced at £20 per car, per day. These need to be booked in advance so please contact us if you would like one. •Reservations for over 6 people must be paid in full 28 days prior to arrival. You will be contacted when payment is due. •Our apartments are spread across 3 individual apartment blocks, not all of these blocks have an elevator. 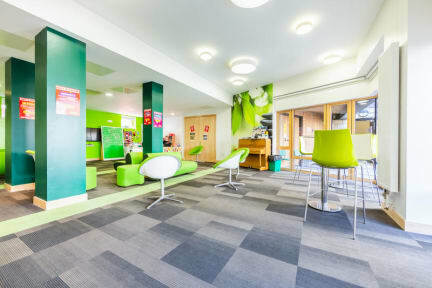 If you require a lower floor or lift access please contact the hostel directly prior to your arrival as it may not be possible to meet this request on arrival. •All bathroom facilities are shared, none of our rooms have en-suite facilities. Whatever brings you to Edinburgh there’s nowhere better to stay than Euro Hostel Edinburgh Halls. If you're looking for private accommodation why not book one of our private apartments and you'll have exclusive use of the kitchen, lounge area and bathrooms. Our largest apartments sleep 12 guests and many of our groups book more than one allowing them all to stay together in one central location. If you're travelling with a smaller group we have apartments for 3, 4, 5 or 6 guests and if booked privately you'll only share your kitchen and bathroom with members of your own group. All of our rooms are modern and clean and each apartment kitchen comes fully equipped with utensils, pots, pans, crockery and cutlery. Each of our apartments is made up of single and/or twin private bedrooms offering you privacy if you're travelling alone but allowing you to be part of our hostel atmosphere as you can meet lots of new people in the shared lounge and kitchen - it's the best of both worlds. If you book a single or twin private bedroom you'll have the room all to yourself and share bathroom and kitchen facilities with the other guests staying in your apartment. You will also be provided with fresh linen and towels are available to hire from reception for a small fee. 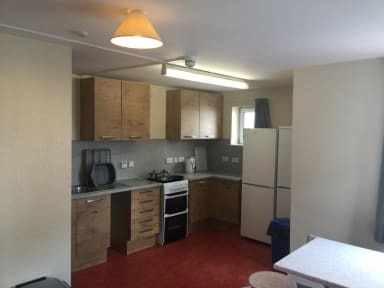 Of course, if you're booking a single or twin bedroom you will have the company of flat mates in the communal areas but there's plenty of space. All bedrooms are, of course, private and fully secure. Room wasn't clean, couldn't close the window. The only good thing was the shower. Also, the fire alarm went off, cause someone burnt their food (this was after 10 pm), but it took over 20 mins to get it shut off and no explanation as to why it went, we heard it from another guest.